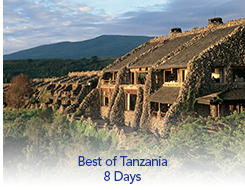 This itinerary celebrates access to the reserves throughout Tanzania. Wildlife abounds with ample opportunity to experience mountain biking, a village visit, a forest hike or a short nature walk. Archeology enthusiasts will be fascinated by a visit to Olduvai Gorge where Dr. Leakey conducted extensive excavations.